On June 28, 2016, a street hawker fleeing from arrest by an official of the Kick Against Indiscipline (KAI) squad was crushed to death by an incoming BRT bus along the ever-busy Ikorodu Expressway in Lagos. Enraged by the incident, other street hawkers in the vicinity damaged buses belonging not only to the state-owned Bus Rapid Transit (BRT) scheme, but also private vehicles and those belonging to the Rapid Response Squad (RRS) of the Lagos State Police Command. Typical of such incidents, hoodlums took undue advantage of the chaos to cause even more havoc and rob passersby, until the quick intervention of men of the RRS saved the situation. The above incident preceded the Lagos State Government’s surprising announcement a day later, of its intention to ban street-trading in Lagos metropolis, with effect from July 1, 2016. Premising the ban on a previous legislation, Lagos State Street Trading and Illegal Market Prohibition Law 2003 (STL), the State Government adduced several reasons in support of this directive. Among other things, the Lagos government claimed the ban was necessary to resolve security and traffic gridlock challenges often occasioned by street traders. As the ban took effect, KAI officials arrested hundred of street-hawkers in different parts of Lagos – predominantly from densely-populated areas such as Maryland, Oshodi, Ikeja, Ojota, Ojuelegba, and Obalende – confiscating their goods in the process. The arrested traders may face either a jail term or fine, or both. 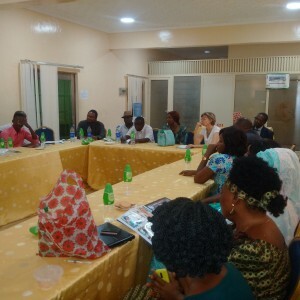 Working in collaboration with a group of organizations engaged in public advocacy around informal workers and communities, Spaces for Change met with the executives and members of the Federation of Informal Workers (FIWON) to understand how the recent ban on street-trading is impacting on street-traders, informal workers and their businesses in Lagos State. The meeting held on July 14, 2016, also had in attendance, civil society groups, and other stakeholders in the urban sector. Experiences shared by FIWON’s General Secretary, Mr. Gbenga Komolafe, and several members of the association revealed that since 2003, many street traders have been arrested and detained on the basis of the STL law, and the Lagos State Road Traffic Law, 2012. FIWON brokered meetings with the government with a view toward limiting the penalties faced for street trading to arrests and payment of fines without detention in prison. On the basis of a truce reached with the government, there was an agreement that there would be no sales, motorcycles and/or tricycles on major highways save the inner roads within the state. According to Mr. Gbenga Komolafe, despite the agreement, harassment of street traders persisted, with state officials demanding all manner of taxes, levies, illegal tolls while at the same time, criminalising the informal work that they do. The present clampdown, he stated, has led to even more infringements on the rights of FIWON members. The group, FIWON, now wishes to use the present crisis as a medium to revisit the law, test its constitutionality, and push for policy tackling crime and not targeting the poor or creating unrealistic elitist rules. on the scope of the term, ‘street trader’, and the correct interpretation e.g. are newspaper vendors, road side mechanics, cyclers peddling ice cream etc street traders; and also subject to the ban? Just who are street traders especially as the provisions of the law appears to criminalise all who offer services on the streets? location of the state’s approved distribution outlets – Where should residents purchase items such as national dailies from? what becomes of goods confiscated? Since goods are not returned to the arrested street trader upon release, who benefits from seizures made? Do other law-abiding citizens have a right to inquire and to know these facts? Are there auctions? Where? How soon after confiscation and what are the parameters for bidding at such auctions? are there ameliorative policies and enactments envisaged to deal positively with the state’s underdevelopment which has as one evident symptom the burgeoning informal sector? why is the lower income stratum of society not taken into consideration in state town-planning schemes? It has been noted that in the last decade, several markets that have been demolished and/or renovated are beyond the reach of the poor who form the greater number of the trading population. In fact several, are forced out of the erstwhile shanty market stalls they legally habited and traded in. They have now moved to the market/street sidewalks to barely scrape a living. for 5 years: 10.8sqm – N 500,000 yearly (N41,626 monthly). what about fair trade policies? Does this measure (the ban) spring from government’ stated interest to bring in trading monopolies that utilise strategies which drive retail traders out of business? who benefits from these monopolistic ideals especially where a majority of the state populace live below the poverty line? Whose interest is being executed by such policies and laws? what about Habitat 3 on Sustainable Cities? Is the dream to develop the state into one of the world’ top 50 cities still existent? SPACES FOR CHANGE’s preliminary assessment of the STL reveals several provisions that appear arbitrary, obsolete, insensitive to current social and economic realities, and inimical to the rights of millions of street traders and those engaged in informal trading across the state who depend on the earnings from street-trading for their daily sustenance. Beyond prohibiting street-trading, or exhibiting any goods, wares, articles offered for sale on the streets, it empowers designated state authorities to seize those items, and have those items sold or disposed of in any manner described by the deputy governor. The STL also requires arrested street-traders to forfeit their goods, whether or not the owner has been convicted of any contravention. It also extends punishment to buyers of those goods or wares, and those who are deemed as obstructing enforcement agencies from effecting arrests and seizure of goods. Some provisions require on-the-spot payment of fines, while criminal summons are issued against those unable to pay immediately. As the above paragraph shows, basic rights and freedoms guaranteed to all Nigerians, including street-traders, under the Constitution of the Federal Republic of Nigeria, 1999, are under serious threat. Pushing for the reform of provisions that are unrealistic under the present social-economic realm and arbitrary is a long term agenda which we believe to be the sustainable solution to the inherent contraventions. In the short term, there is an identified need for a rights-based approach to enlighten members of the public and in particular street traders, on the implications of this law on their basic rights and freedoms, including social and economic rights. Responding to a specific request from FIWON leadership for legal empowerment, Spaces for Change scheduled a one-day legal training to equip FIWON with the knowledge and resources needed to challenge this law, and defend themselves from its apparently mean impositions. Issues relating to bail upon arrest, forfeiture of goods, legal representation, making statements, constitutional rights of fair hearing, and rights of appeal, are among the key focal areas of the training. Going forward, Spaces for Change’s team of lawyers will offer free legal advice to street-traders and informal workers on the legal and practical steps for redressing the negative effects of the STL’s implementation. We will also continue to offer bespoke legal education programs that expose street traders to the plethora of state and national legislations that they could also use to demand legal protection against executive arbitrariness and abuse of their rights by state authorities. Realigning the vision and missions of the state’s Ministry of Wealth Creation and Empowerment to establish programs and schemes that empower the poor. Consider the construction of market stalls with durable, yet less expensive building materials to enhance affordability to lower-income traders. Expansion of the sidewalks to accommodate customized kiosks for solely lower-income traders. Establishing a complaints mechanism though which aggrieved informal sector workers can express their unique challenges, enlist government support, and get some measure of redress is needed.